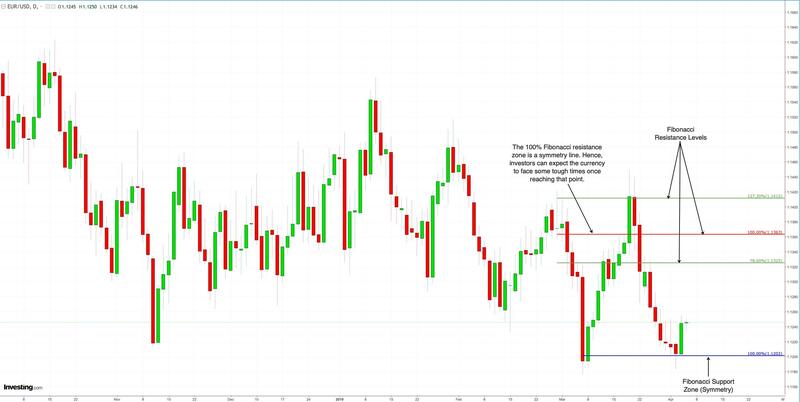 The euro has been trading in a downward channel from March 21, 2019. The eurozone's retail sales rose by 0.4% in March. I am leaning towards the bulls, pushing the value of the euro till the 1.1363-mark. From March 21, 2019, the euro (FXE, UUP) has been trading in a downward channel that has left many traders frustrated. Nevertheless, I believe the currency's descent has come to an end. I say this as I expect the euro to rise until the range between 1.1325 and 1.1363. Hence, to establish the likelihood of this occurring, I will look at the fundamental news affecting the pair, while also analyzing the charts using technical analysis tools. I believe the high level of confusion created by Brexit in the United Kingdom will significantly benefit the euro. I say this as I expect cash inflows into the United Kingdom to reduce further as any savvy investor will not want to put their hard-earned money into a currency that will most likely devalue in the long term. Thus, due to this risk, I expect cash inflows into the eurozone to rise which will give the euro a shove in the right direction. Moreover, several businesses are in the process of shifting their headquarters to various EU countries. Thus, I believe over the course of 2019 this will cause the United Kingdom to lose a significant portion of its business which will benefit euro across the board. One of the reasons I expect a rise in the euro’s value is due to the latest eurozone macroeconomic data. The eurozone retail sales rose by 0.4% in March, which surpassed the analyst estimate of 0.2%. Moreover, it is a steep rise from the prior month's value of -0.9%. Furthermore, the Markit PMI Composite came in at 51.6, which is the same as the analyst forecast. Hence, due to all the macroeconomic data being positive, I expect an upward channel to form in the currency. The latest U.S. statistics have been negative. I say this as the employment statistics for March were dismal. This is as the 'Non-farm Employment' statistic came in at 129,000 in March, which is lower than the analyst estimate of 184,000. Moreover, it is a steep fall from the prior month’s value of 197,000. Furthermore, the retail sales fell by 0.2% in February after an increase of 0.7% in January. Thus, I believe these two statistics will place a great deal of bearish pressure on the greenback. This, in turn, will provide the euro with some much-needed support. The pair’s daily chart indicates that the euro’s bearish fall has come to an end. This is due to the formation of a ‘Bullish Engulfing’ candle pattern which indicates to investors that the bearish rally has stalled. Moreover, it signals to investors that the bulls have once again gained control of the market. Furthermore, the euro has taken support from the 100% Fibonacci support level at 1.1202. This confirms to investors that a bullish reversal is underway as the 100% Fibonacci support level is a symmetry level. On the price target front, I expect the euro to rise until the range between the 78.6% and 100% Fibonacci resistance levels. The 78.6% Fibonacci resistance level is at 1.1325, while the 100% Fibonacci resistance level is at 1.1363. Moreover, I do not expect the euro to rise above the 100% Fibonacci resistance level as this is a Fibonacci symmetry line. On the indicator facet, the short-term RSI has flattened out after being in steep descent for the prior nine sessions. This supports my notion that the euro will be rising until the range between the 78.6% and 100% Fibonacci resistance levels. Overall, I am leaning towards the bulls pushing the value of the euro until the range between 1.1325 and 1.1363. This is driven by the fact that the technicals and fundamentals support an ascent in the currency’s value until that point. However, whichever way you do decide to trade, make sure you utilize trailing stops, as this will aid in capital preservation. Disclosure: I/we have no positions in any stocks mentioned, but may initiate a long position in FXE over the next 72 hours. I wrote this article myself, and it expresses my own opinions. I am not receiving compensation for it (other than from Seeking Alpha). I have no business relationship with any company whose stock is mentioned in this article.